"I love my business cards! I was really impressed with the print quality, the speed at which I received my order, and the convenient packaging. Super pleased all around! I'll definitely be ordering again and referring friends." A lot of business cards look cool, but how do they feel? Does your business card feel like a winner? With PFL's 24pt thick business cards, your card will stand out from the deck at any trade show or event. Almost twice as thick as a traditional business card, the extra thick card stock not only gives your business cards that premium, high end presentation; they literally feel different and stand out in a pile of standard cards. Today's busy professional is constantly on the move, and damaged crumpled business cards are one of the first casualties of frequent travel. With extremely durable 24pt heavy card stock, your thick business cards will last longer; maintaining their shape without easily crumpling or folding. This sturdy quality gives your company an automatic air of quality, as it stands strong amongst the tattered and dog-eared cards of your competition. 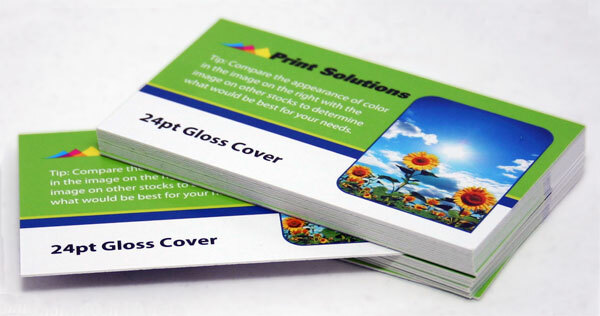 Depending on your desired look and feel, thick 24pt business cards are available with a Gloss or Dull/Matte finish. Looking to jazz up your thick business cards even more? Consider adding rounded corners to your card, or even a custom die cut shape for added pizazz. The only thing more remarkable than an extra thick business card, is a thick business card with custom effects like die cutting, foil stamping, or soft touch coating or UV coating. Consider saving money with one of PFL's snazzy standing die shapes, ready and waiting to trim your card into a distinctive visual masterpiece. Have questions about using 24 pt cover stock for your next printing project? Call 800-­930-2423 now to talk to one of our friendly print experts.